I am slowly chipping away at a few projects that I have been wanting to get done. I am going to have back surgery soon, so there is a lot I can't do at the moment, but I thought if I was careful, I could maybe refinish an end table that needed some attention badly. This is a piece that I have had for years. One of those fabulous thrift store finds some where along the way. Such a unique piece and the perfect size to use almost anywhere. It's a reproduction of a candle stick table from the Museum Collection by Lane. As you can see, it was in bad need of a makeover. This poor table was really showing it's years of wear. First thing was to sand it down really good. I wanted it to compliment my dark walnut and gray pieces in the family room. So I decided on a walnut top with a painted-distressed gray bottom. (Doesn't everybody refinish furniture in their living room? The weather is too warm to do it outside, so living room it is.) I used General Finishes Walnut Gel Stain. It took two coats to get the really dark finish that I wanted. After the stain was dry, it was time to paint the bottom. 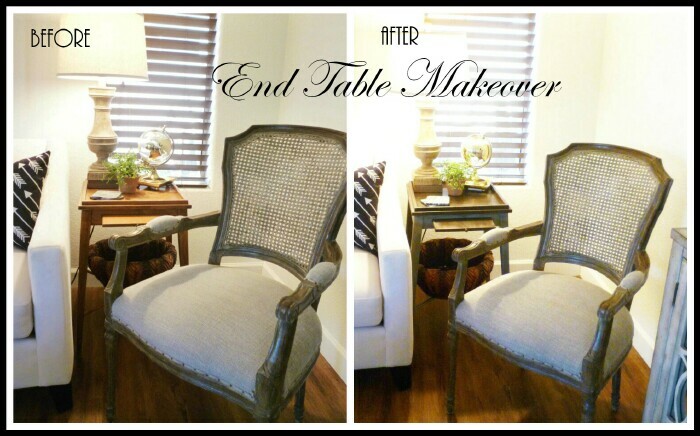 I had some leftover light gray chalk paint, so I elevated the table on a stool and gave it the first coat. Now it needed some distressing, so I mixed up some different paints, brown, gray and black on a plate and did some dry brushing. The camera makes the brown look really yellow, but in real life it is brown. A satin clear coat and it was all done. It goes so much better in my room with my furniture. This is the fabric I have draped over the brown chair. Now that the table is done, I really do like this fabric to recover the chair with. It will have to wait until I recover from back surgery, but I think it will be perfect. One more thing checked off my to-do list. What a great little table! I love the way it turned out. Best of luck with your back surgery. What a sweet table. Great makeover. Looks fabulous. This is so inspirational! I have some little tables that I want to try in another color. They were things left in the attic by the previous resident, so they're perfect for experimentation. Nice makeover! I love your neutral & traditional decorating style. You have a knack for adding visual interest by using various textures in a space. That's a great table and I love the new finish! Good luck with the surgery. Well aren't you just the handy dandy make over queen!! I can never see the vision and admire people like you who can take a piece of furniture and recreate it. Well done!! Hope all goes well with your surgery. My brother just had back surgery and is so happy with the results. That is a handy little table to have. The new look was just the thing to make it even better. Speaking of transformations, this one is long overdue at my home too. Thanks for sharing such an informative and interesting post. But it becomes really hectic to clean after DIY projects. but Thanks to the new jersey cleaning services and their work is really neat and clean. I must say if anyone needs such home cleaning services, he must try them. Such a beautiful transformation. I am featuring this tonight at my Swing into Spring party. Hope your back surgery is a great success and is not too hard on you. Bless you!